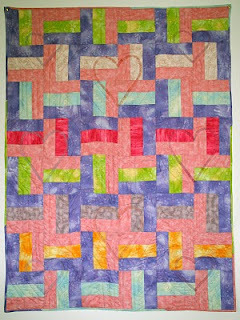 Here is another quilt I made in the latter part of 2010 for a friend's new baby. A had a second girl and she loves pink and lilac - colours I would never ever normally use. But she is a good friend and so I made the necessary sacrifice and bought pink and lilac. 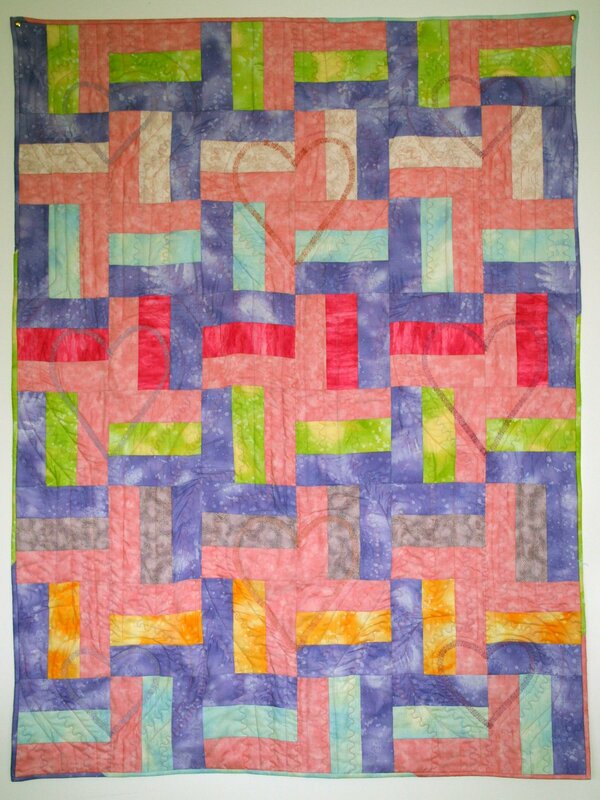 It was meant to be in a rail-fence pattern, but I pieced it differently and was happy with the results so left it. It really is very simple - nine different fabric cut into 2in strips, joined into groups of three strips. The same fabrics on the outside of the strip sets, with a different colour in the middle each time. Each strip set was cross cut into squares, which were stitched together in rows and the rows stitched together. For the quilting pattern, I cut out two sizes of hearts from freezer paper, which I then pressed onto the quilt top to use as templates. I hope the baby gets good use from it. From an extra strip of the fabric that I had practiced quilting on, I made a little case for my new mobile phone. I am coming into the 21st century at last - when I can work out how to use it.